Natural hair, locks, braids, hair extensions, press and curl, hair cuts, and massages. Metro Discount: First time clients receive 10% discount on any service. 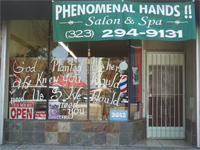 Go Metro: Phenomenal Hands Salon & Spa is located at 4431 Crenshaw Bl. Find your best route with the Trip Planner. More Info: For information email phenomenalhands@gmail.com or call 323.294.9131.